Chapter 4: Community. This expert recommendation is part of a series on helping students engage productively in active learning classrooms. It is challenging for instructors to create and maintain a classroom environment where students are comfortable engaging with each other and sharing their results with the class. This difficulty increases with class size. This chapter focuses on helping students to engage productively in active learning classrooms, through creating a supportive and respectful classroom community that welcomes engagement. The goals of this project is to identify and disseminate strategies that instructors use to engage students in active learning classrooms. This project arose from the Framing the Interactive Engagement Classroom project, led by Stephanie Chasteen (University of Colorado Boulder), with collaboration from Jon Gaffney (Eastern Kentucky University) and Andrew Boudreaux (Western Washington University).Many thanks to University of Colorado reviewers Rebecca Ciancanelli and Jenny Knight, plus undergraduate assistant Maya Fohrman. This work was generously supported by the University of Colorado Science Education Initiative and the University of Colorado Center for STEM Learning, via a Chancellor’s Award. Please contact Stephanie Chasteen with any comments or questions. Click here to access the entire set of Expert Recommendations on productive student engagement. You may also download a zip file of all recommendations and activities (26 MB), a PDF of these articles, and a PDF summary of our recommended strategies. How does classroom community affect student engagement? 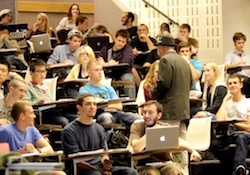 While the interactivity inherent in active learning techniques can be motivating in itself, many studies have demonstrated the importance of a respectful, supportive atmosphere, with clear norms for participation (Fredericks et al., 2004). Thus, we suggest creating a “community of learners”, in which the classroom is intentionally built with communication styles and structures that enable constructive discussion (Moreno, 2009). This doesn’t mean you should have a “fluffy” course, with low expectations and nothing but team building exercises: You can, and should, still have high expectations for your students and how your class time is spent. But attending to the student experience through intentional framing of the classroom culture is crucial to making active learning work in the long term (Moreno, 2009). In smaller courses, you can use personal communication to achieve this; in a larger course, you will need to rely on more general cues to students. Below are general ideas to keep in mind regarding student needs in a community of learners. Students need to know the norms for participation. Some student pushback to active learning could be interpreted in a cultural light: when the patterns and norms of interaction change, students may be uncomfortable having to readjust their expectations (Penuel, Roschelle and Abrahamson, 2006). Setting clear norms for participation, and setting them early, helps calibrate student expectations. See Chapter 1: Expectations. Student learning is influenced by social factors. Learning does not happen only within an individual student; there is a strong interaction between the student and the social environment in which she finds herself (Vygotsky, 1978; Boekaerts, 2010; Lemke, 2001; Ferlazzo, 2015). The importance of social factors in learning is the essence of sociocultural theories of education that focus on the importance of social interaction for student learning and behavior (Moreno, 2009). Additionally, many theories of motivation highlight that students need to feel related to others (i.e., respected, valued, and included) in order to be motivated to engage (Moreno, 2009; Deci, Ryan and Williams, 1996). Negative attitudes towards active learning could be an indication that this psychological need is not being met. Your classroom has a culture. The way you communicate and the structures you create form a set of norms and expectations that define a class culture. Is the instructor primarily in a position of power, or are they working alongside students? What is the general attitude towards learning in the course? What is the stance towards collaboration? How are student ideas responded to? One of the few classroom techniques that has been shown to improve students’ attitudes towards learning physics (as measured by the CLASS instrument) is Modeling Instruction (Brewe et al., 2009; Brewe et al., 2013). One of the notable features of Modeling is that it uses a particular type of classroom discourse structure that is geared towards creating a culture in which all feel safe and valued in their contribution. A concrete discussion of Modeling Discourse Management can be found in Desbien (2002) and forms the basis of some of the recommendations in this chapter, and a new study of “instructor talk” provides insight into the type of language instructors use which promote a positive class culture (Seidel et al., 2015). Students can feel anxious in front of their peers. To engage in active learning, students need to feel comfortable taking risks in the classroom and then have those risks rewarded (Penuel, Roschelle and Abrahamson, 2006). There is very real possibility that anxiety will be generated in an active classroom as students put their ideas forward into a public forum. In this situation, there are many opportunities for both students and the instructor to “lose face,” or our ability to be seen positively by others. When that public identity is threatened, this is called “face threat”. There are many strategies that an instructor can use to mitigate face threat (called “facework”), and studies are indicating that attending to facework seems to be connected to instructor’s credibility in the students’ eyes and their formal instructor evaluations (Witt & Kerssen-Griep, 2011; Gaffney and Whitaker, 2015). For example, you can learn student names, respond positively to student ideas, praise success, be tactful when critiquing work, and help students feel that “we’re all in this together” (Lim and Bowers, 1991; Kerssen-Griep, 2001). All of these practices help to create a safe climate for risk taking and protect students from losing face. Conversely, acting impatient, condescending, annoyed, or accusatory has negative impacts on class climate (see for example Scherr, Close and McKagan, 2011). Below I provide a variety of recommendations for creating a respectful, positive class culture where students feel safe in risking their ideas. By using just a few of these strategies you will be able to cultivate a productive atmosphere for learning and collaboration. From the first day, you can communicate norms for collaboration, and have students engage in the types of interaction that you will be expecting during the rest of the semester. To hear from several seasoned instructors, watch this 5-minute video on establishing a comfortable classroom climate. Decide on your norms and goals and assert them. What are your goals for collaboration? Some common norms for group work include (Tanner, 2013): “Everyone here has something to learn.”; “Everyone here is expected to support their colleagues in identifying and clarifying their confusions about biology.”; “All ideas shared during class will be treated respectfully.” For an overview of different philosophies and approaches that can be used on the first day, watch this 2-minute video of instructors’ goals on the first day and this 5-minute video of how their approaches have changed over time, and as a result of the type of class that they teach. Many instructors simply verbally assert the expectations, often on the first day of class. See our sample slides (slides-explaining active learning (PPT)) for some examples. You might start class with practice clicker questions to generate a sense of community (such as, “How did you arrive to school today?” “How many of you hate math?”) Use this opportunity to demonstrate productive discussion styles. Use early icebreakers for students to become acquainted. For example, ask them to introduce themselves to their neighbor, and then introduce their neighbor to two other students. You can use the “whip around”, where each student is asked to give a 30-second response to a question (such as “what is your favorite memory of learning biology?”). In large classes, you might do a whip-around by row or by group (Tanner, 2013). For more icebreaker ideas, see this link. By focusing an icebreaker on emotional content, you create a respectful, personal atmosphere from the outset. If you feel that there are issues with students not feeling that they belong in your course (e.g., a minority of women), consider a Social Belonging Intervention. Actions speak louder than words. You can directly demonstrate your expectations by having students engage in group behavior, from the first day. Examples that are appropriate for the first day of class include Fermi Questions, Make a Paper Airplane, and Nature of Science Activities. See our Group Skill Building activity for suggestions on forming the first groups and supporting discussion about group roles. Here are some other examples of first day activities to create class climate and to practice science skills. The most democratic approach to norm-setting is to allow students to define their own rules of engagement or social norms for the class, which can include expectations for the use of technology, engagement in class discussions, off-task behavior during class, and more. This activity can serve as an excellent first-day activity, helping students to coalesce as a community, as well as establish productive, respectful social norms. For an example of this approach, see Sieber, 2001. The way that you respond to student ideas and contributions sends a powerful message about the classroom norms and your expectations. Model the behavior that you want to cultivate in students, and send explicit messages about respect and inclusion. Communicate a personal enthusiasm for debate and productive conflict, where students are encouraged to address each other's viewpoints (Barron and Darling-Hammond, 2010). Below are some ways to promote such a respectful culture. Validate and build on student ideas. Doing so consistently creates a culture where everyone’s ideas are valued. For example, be responsive to student ideas that are brought up in large group discussions of clicker questions, so that it’s clear that if students take the risk to speak up, they will be rewarded by having their ideas addressed. You can model how to productively listen to multiple ideas by asking the entire class to brainstorm ideas while you write them on the board, listing pros and cons of each idea. This provides a good model for groups to follow when listening to each other’s ideas (Moreno 2009). Be careful of unintentional negative messages: For example, the word “just” (e.g., "It's just conservation of energy,") implies that the solution is trivial. See Gavrin, 2015 for more unintended negative messages we tend to send. If you want broader participation from students, set those expectations clearly. For example, Tanner (2013) suggests saying: “I’m going to pose a question, and I’d like to see at least three hands of colleagues here who would share their ideas. I won't hear from anyone until I’ve got those three volunteers”. Stick to your rule, or students will quickly learn that they can outwait you. If you still see no hands, maybe they need help processing the question; ask them to turn and talk to their neighbor in a “think pair share” style. Be wary of the “rapid reward,” where you respond affirmatively as soon as you hear the correct answer, as this discourages other students from adding their ideas. Additionally, call on students who are not necessarily perceived as high achievers, to frame the goal of questioning as hearing from all students (not just getting the right answer), and to probe student responses (rather than just explaining why a wrong answer is wrong.) See Chapter 8: Student Discussions for more ideas on getting students to participate in whole-class discussions. Acknowledge student responses neutrally. That doesn’t mean that you have to give weight to an inaccurate idea. Stating, “I’d like to hear from a number of us about our thinking on this, and then we can sort out what we are sure of and what we are confused about,” lets students know that you will not be evaluating the merit of ideas. You can also say, “I hear you saying X, is that righ?” or “thanks for sharing your ideas” after a student responds to create a positive respectful culture in the class. This can increase the number of students willing to share their ideas (Tanner, 2013). If you get an unexpected question or answer, try to work with that idea instead of shutting it down. Here is an excellent example of a teacher dealing with unexpected questions in a middle school classroom. Through your facilitation of conversation and discussion you can create an atmosphere where students feel that they can contribute – and that they are not at risk of looking stupid. Below are some ideas for encouraging such productive discourse, from Desbien (2004; p. 49-64). For ideas on how to assess students in a way that promotes a culture of growth and learning, see Chapter 3: Motivation. Collaboratively decide on the meaning of vocabulary. Scientific language can feel alienating and foreign to students. You might create a rule that no term can be used in class discussions until its' definition has been agreed on. This gives students a sense of ownership, and democracy. Communication tools can be important elements of your classroom. You can use small whiteboards (where students write and share their ideas) or clickers (where the whole class can contribute to a discussion), or just pieces of paper. Out-of-class communication tools, such as discussion boards, are also valuable ways to create community and collaboration. As groups work on a problem, the instructor can seed their discussion with a question or hint. This gives students a chance to work through the idea and gain ownership. A good seeding question is direct, and helps the group to move forward. Don't wait until the end of their discussion to ask a seeding question, or the group may not have time to work through it. Seeding can be a way of bringing an idea to the class as a whole, so that it comes from students, rather than the instructor. If a group is reluctant to talk in the whole-class discussions, you can seed a simple idea that's easy for them to introduce, or a question that they can ask the whole class. One challenge with seeding is that, when the students come up with ideas that you haven't intended, you must determine whether the tangential discussion is worthwhile. Frame yourself as the guide, but not the leader of discussions. This requires students to take ownership of the direction of their conversations, both in small groups and in large class discussions. It can be difficult to resist explaining ideas that are not understood, but this is a time during which the instructor can pay careful attention and use that information to guide the class. Here is an example of students productively working in small groups, with productive guidance from the teacher in a middle school physics classroom. Correct errors in a way that is not embarrassing. Help students avoid losing face in front of their peers if their ideas are off-target by focusing on their strengths, not weaknesses. When students use hedging language such as “I don’t know,” or responding nervously when criticized, they may be indicating that they feel threatened. If you quickly respond in such situations to mitigate face threat, it can build trust and confidence, enhancing student motivation (Gaffney and Whitaker, 2015). You can do this by focusing on the strengths of the idea (find something that is correct about the idea, or validate in the assumptions that they are making) and through nonverbal cues (stand near the student, meet their gaze, gesture, and use warmth in your voice; Kerssen-Griep, 2001). Intentionally fail to provide closure. In the whole class discussion, you do not necessarily need to weigh in on unresolved issues -- keeping these issues alive will result in students continuing to wrestle with the ideas after the end of class, and return with new ideas. Lack of closure is a valuable tool for keeping students engaged as well as increasing office hour attendance. Be sure to return to those unresolved questions, however, or students may feel frustrated. Personally reflect on the discussion. Are you pleased with your own management of the discussion? Questions you might reflect on are: Did I intervene too much during discussion? Did I let the discussion progress too far? Not far enough? Was more time needed for the activity? What ideas surfaced that I was not prepared for? Train instructional assistants to use productive discourse. In a large course, you may have several Teaching or Learning Assistants who can circulate during group activities and facilitate student discussion. Many of these staff, particularly graduate students, may see their job as correcting student errors and knowing the answer. This can be counterproductive to creating a collaborative atmosphere focused on reasoning through the answer. Don't skimp on preparing these staff to work well with students. Some resources for training instructional staff include Periscope, this video on running weekly preparation sessions, and this article describing interactions during tutorial sessions (Scherr, Close and McKagan, 2012). To create trust and a “side by side” relationship with students, you can use a variety of verbal and non-verbal techniques such as humor, body language, vulnerability, learning student names, and more. These create a sense of social immediacy that increases students’ participation (Seidel and Tanner, 2013). While more challenging in a larger class, there are still some strategies you can use, below. To increase trust and confidence, use techniques such as humor, less formal language, compliments, smiling, open body position, come out front behind the desk, make eye contact, gesture, and talk to them like a colleague. These behaviors can help students feel that you’re on their side (Witt and Kerssen-Griep, 2011; Kerssen-Griep, 2001). Be vulnerable and take risks. Being somewhat vulnerable can help to build your credibility by showing that you are willing to take risks too. This can be particularly valuable on the first day of the course. You might give a brief biography on the first day of class, or open the floor to any and all questions, no matter how silly, and reveal personal information along the way (see the Ask Me Anything activity.) I know one instructor who makes sure to do something ridiculous on the first day of class (like standing on a desk) to demonstrate to students that she won’t ask them to do anything she’s not willing to do as well. This is easier said than done, especially in a large class. However, even if you learn just a few names, it sends a powerful message. On the first day, you can ask students to write their names and a few pieces of information on an index card. Carry these around, perhaps adding a photo of the student, and use them to call on students during class discussions. Another idea is to use Table Tents for students to introduce themselves to classmates, and keep their name visible for you. Both of these items (index cards or table tents) can be sorted to create small groups (Tanner, 2013). Listen to student feedback and complaints. If students complain that things are boring or too hard, acknowledge their complaints. Ignoring the complaint and focusing on the work to be done sends the message that the work is more important than the individual and their emotions. Responding to and acknowledging negative emotions indicates that the teacher understands the student’s position – and provides a productive opportunity for changing the activity at hand, or suggesting an alternative perspective to the student (Reeve, 2009). Other ideas include soliciting Rumors about the course on the first day, or using a midterm Stop Go Change evaluation to solicit student ideas. It is challenging for instructors to create and maintain a classroom environment where students are comfortable engaging with each other and sharing their results with the class. This difficulty increases with class size. Help students to engage productively in active learning classrooms, through creating a supportive and respectful classroom community that welcomes engagement. From the first day, you can communicate norms for collaboration, and have students engage in the types of interaction that you will be expecting during the rest of the semester. The way that you respond to student ideas and contributions sends a powerful message about the classroom norms and your expectations. Validate and build on student ideas. Through your facilitation of conversation and discussion you can create an atmosphere where students feel that they can contribute – and that they are not at risk of looking stupid. Collaboratively decide on the meaning of vocabulary. Use communication tools to facilitate discussion. Frame yourself as the guide, but not the leader of discussions. Correct errors in a way that is not embarrassing. To create trust and a “side by side” relationship with students, you can use a variety of verbal and non-verbal techniques such as humor, learning student names, body language, and vulnerability. All of these techniques are likely to create a sense of social immediacy and increase student participation. Gavrin, A., Respecting our students, The Physics Teacher. 53(7), 412 (Oct 2015). L. Lemke, Articulating communities: Sociocultural perspectives on science education, Journal of Research in Science Teaching. 38(3) (2001). Kerssen-Griep, J., Teacher communication activities relevant to student motivation: Classroom facework and instructional communication competence, Communication education. 50 (3), 256-273 (2001). Slavin, R. E., Cooperative learning: Theory, research, and practice(2nd ed. ), Boston: Allyn and Bacon (1995). Witt P.L. and Kerssen-Griep, J., Instructional Feedback I: The interaction of facework and immediacy on students' perceptions of instructor credibility, Communication Education, 60 (1), 75-94 (2010). Barron,B. and L. Darling-Hammond, Prospects and challenges for inquiry-based approaches to learning, in The Nature of Learning: Using Research to Inspire Practice, OECD Publishing, Paris. (2010). Brewe, Kramer, O'Brien, Modeling instruction: Positive attitudinal shifts in introductory physics measured with CLASS, Phys. Rev. Spec. Top: Phys. Ed. Rsrch. 5, 013102 (2009). Brewe, E., Traxler, A., de la Garza, J., Kramer, L.H., Extending positive CLASS results across multiple instructors and multiple classes of Modeling Instruction, Phys. Rev. Spec. Topics - Phys. Ed. Rsrch. 9, 020116 (2013). Boekaerts, , The crucial role of motivation and emotion in classroom learning, The Nature of Learning: Using Research to Inspire Practice, Centre for Educational Research and Innovation. 91-111 (2010). Deci E.L, Ryan R.M. and Williams G.C., Need satisfaction and the self-regulation of learning, Learning and individual differences. 8(3), 165-183 (1996). Desbien, D., Modeling discourse management compared to other classroom management styles in university physics, Dissertation, Arizona State University. (2002). Fredericks, J.A., Blumenfeld P.C., Paris, A.H., School Engagement: Potential of the concept, state of the evidence, Review of Educational Research. 74 (1), 59-100 (2004). Lemke, J.L., Articulating communities: Sociocultural perspectives on science education, Journal of Research in Science Teaching. 38(3) (2001). Penuel, Abrahamson, Roschelle, RUNNING HEAD: Theorizing the Networked Classroom. (2006). Scherr R.E., Close H.H., Mckagan S.B., Promoting proximal formative assessment with relational discourse, Physics Education Research Conference 2011, Omaha, Nebraska, 2011 (2012). Seidel, S. B., & Tanner, K. D., What if students revolt?—considering student resistance: origins, options, and opportunities for investigation. CBE-Life Sciences Education. 12(4), 586-595 (2013). Seidel, S.B., Reggi, A. L.., Schinske, J. N., Burrus, L.W., and Tanner, K.B., Beyond the biology: A systematic investigation of noncontent instructor talk in an introductory biology course, CBE-Life Sciences Education, 14(4), 1-14 (2015). Sieber, D.E., Teaching with Social Networks: Establishing a Social Contract (Research Bulletin 10, 2010). Boulder, CO: EDUCAUSE Center for Applied Research. (2010). Tae-Seop Lim and John Waite Bowers, Facework Solidarity, Approbation, and Tact, Human Comm. Res. 17, 415–450 (March 1991). Vygotsky, L. S., Mind in society: The development of higher psychological processes, Cambridge, MA: Harvard University Press. (1978).